I had this idea of a pile of infinite bunnies, I sketch this last night. Crazy cool, love all the different little characters! Louis. I did not repeat any, or at least I did not intended to, but as I got to the top pile it got smaller and smaller forcing me to put dot as eyes. Fun. Love the bunnies! 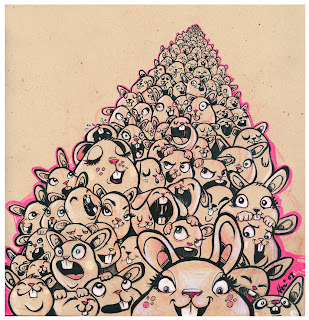 Very nice illustration with all the different expressions...bunnies can really multiply infinitely afterall! wow, your characters are awesome.